Is it a monetary donation? Is it volunteering your time? Is it doing something nice for someone that will be surprised? Is it just being in the moment and spending time with the ones you love, maybe the ones who have been missing you and will appreciate their special time with you? Well, all of these are possibilities! Giving back could mean anything! 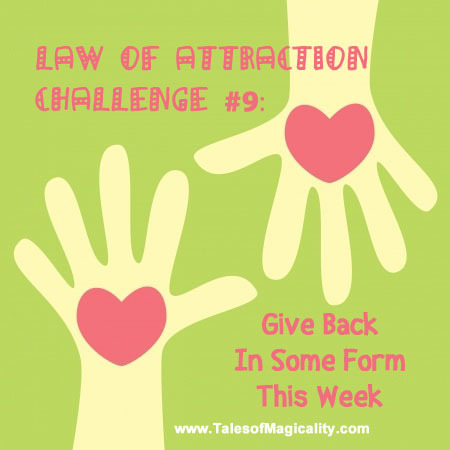 The purpose of this LOA Challenge is the guide you to be consciously aware of making a decision to do something that will benefit someone else AND make you feel good in turn. The attraction cycle will keep spinning, surrounding all of those involved with a positive aura and attracting more of the same–choose to be a part of that feel-good cycle! Run with this idea! Be creative! “Challenge” yourself and share with us how you end up giving back!